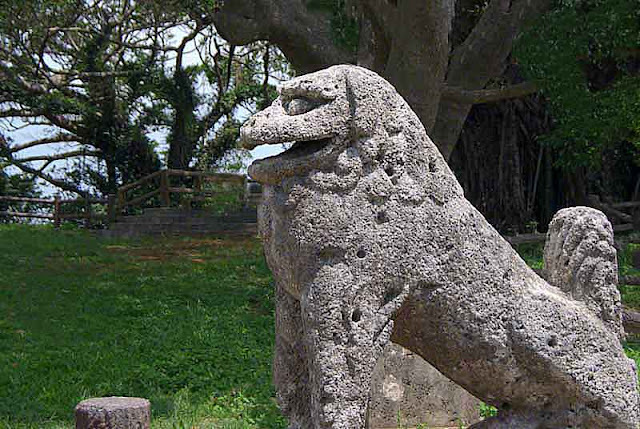 There are 14 of these original stone lions (Shisa) to be found in Yaese. The most famous is the bullet scared one pictured above. It's considered the granddaddy of them all and has been written about extensively. See Doc Graff's version of the legend at Apogee Photo Magazine. 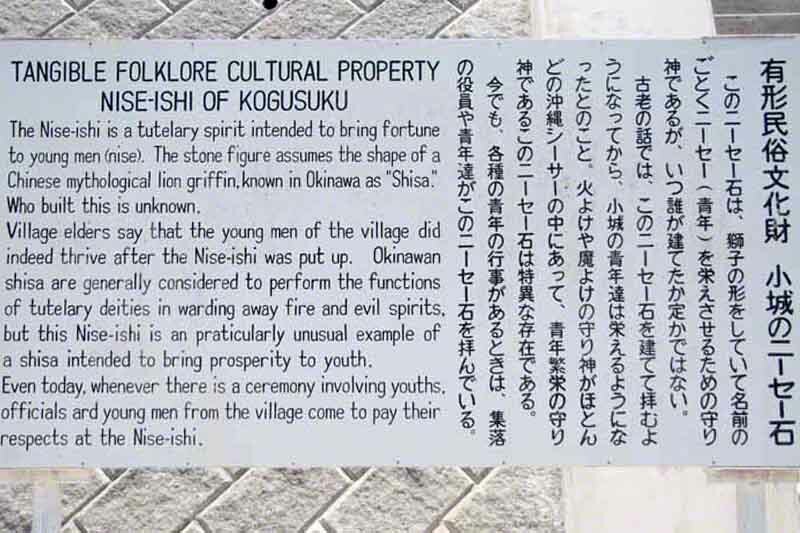 Yesterday, three of us went out and visited some of the antique Shisa statues down south. Lighting conditions were fairly horrible but, we had fun anyway. One old dude (named Jerry) had never seen these statues before so, we felt like tour guides. I'd post a photo of him doing photography but, am waiting for his approval. People can take you to court if, you don't have permission to publish their photo. This guy is older and probably wiser than me so, you'll have to keep on waiting. 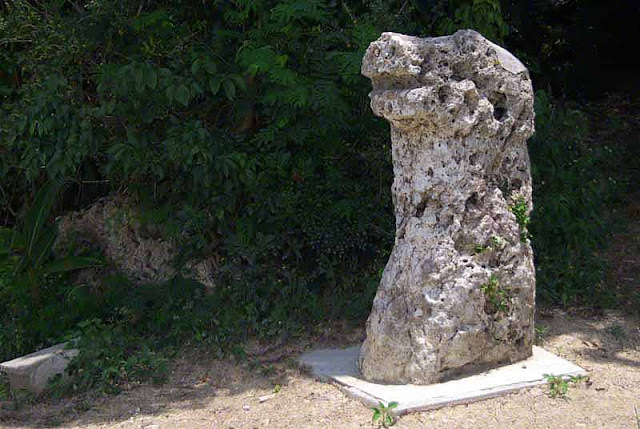 This one doesn't look like much but, it's becoming as famous with tourists as the one above. Over the years, I have noticed improvements to the sites and the ease of access. Convenient parking, stairways and, trimming of vegetation are bonuses. Getting out to find local treasures can be a chore when you're sweating swatting bugs. These statues are easy to reach and even have stairs with handrails, to assist you in climbing. 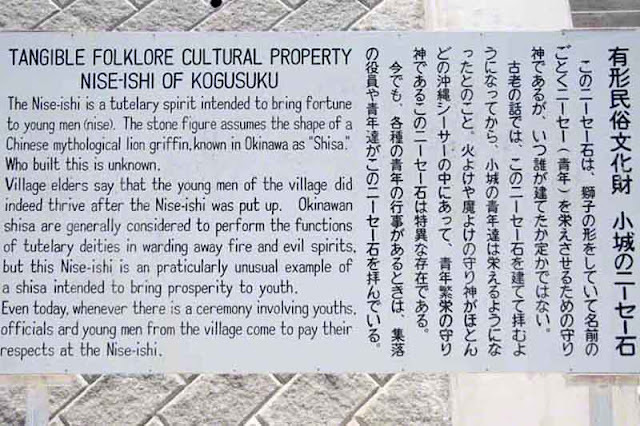 Here they placed a sign, giving the story in English and Japanese. In case you're new around here let me tell you, "I Hate Typing." Whenever you see a sign like this, you should shoot it with your camera. That way, it won't require translation and, writing a short story becomes simple!